Director/Story – George Lucas, Screenplay – George Lucas & Jonathan Hales, Producer – Rick McCallum, Photography – David Tattersall, Music – John Williams, Visual Effects Supervisors – Rob Coleman, John Knoll, Dennis Muren & Ben Snow, Visual Effects/Animation – Industrial Light and Magic, Model Supervisor – Brian Gernard, Special Effects Supervisor – Dave Young, Production Design – Gavin Bocquet. Production Company – Lucasfilm. The Empire is experiencing troubles with breakaway republics. 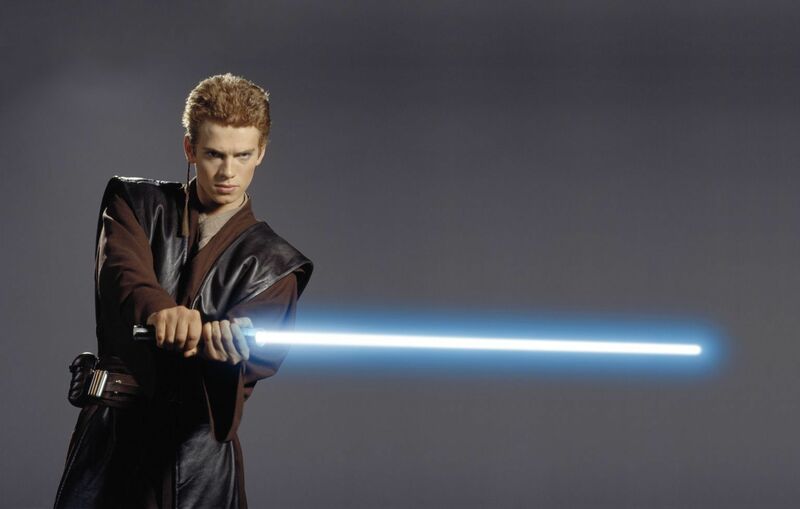 After an assassination attempt on Senator Padme Amidala on the Imperial capital Coruscant, Chancellor Palpatine assigns Obi-Wan Kenobi and his impetuous teenage apprentice Anakin Skywalker to be her bodyguards. This brings the strong feelings that Anakin has for Padme to the surface, even though as a Jedi he must deny them. 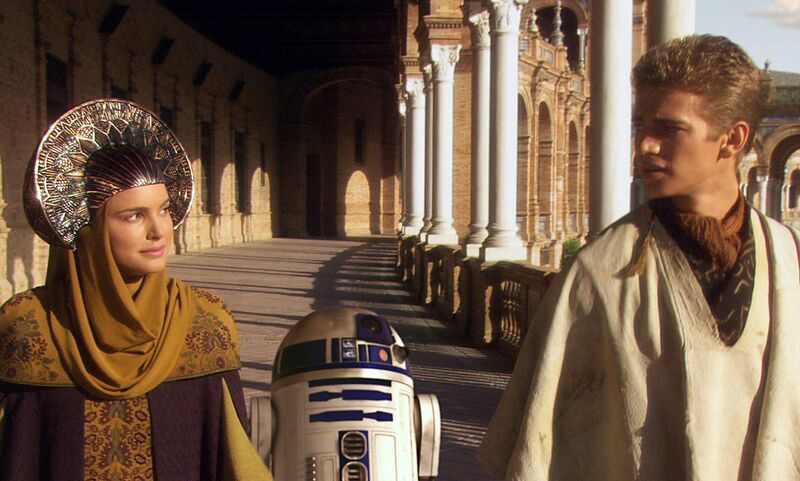 As Anakin accompanies Padme back to Naboo, neither of them find that they can deny the mutual attraction any longer. On the trail of the assassins, Ben Kenobi travels to the hidden water planet Cormino where he discovers that a Jedi Knight has secretly ordered the construction of a clone army. As news of this reaches the Empire, Chancellor Palpatine uses the opportunity to vote in extraordinary powers to deal with the threat. Ben then travels onto the planet Geonosis where he discovers that Count Dooku, a former Jedi Knight who has gone over to the dark side, is massing the breakaway republics under his control. Star Wars Episode II: Attack of the Clones was the second of George Lucas’s prequels to Star Wars (1977). When George Lucas returned to the Star Wars universe with Star Wars Episode I: The Phantom Menace (1999) and a fan anticipation only slightly lesser than the Second Coming, it was an Event. However, the results were almost universally regarded as a big disappointment by anyone who had waited the sixteen years between instalments in the series. The good news is that Attack of the Clones was an improvement over The Phantom Menace, although the new trilogy was still lacking in the magic that the first two episodes, Star Wars and The Empire Strikes Back (1980), had. The Phantom Menace was never much more than some spectacular effects sequences and a few pieces connecting the dots in terms of the series backstory. Attack of the Clones contrives to add a story to the mix as well. George Lucas has placed the romance between Anakin and Princess Amidala at the centre of the story and it gives strength and resonance to everything else that is happening. Sexuality was always something that seemed awkward in the Star Wars universe – there is the famous story of how Lucas asked Carrie Fisher to tape her breasts down during the shooting of Star Wars. When the Han-Leia romance emerged in Empire and Return of the Jedi (1983) it felt embarrassed, the sort of thing written by an adolescent kid not interested in the mushy, girly stuff and wanting to get it over and done with as quickly as possible in order to hurry back to the swashbuckling action. The romance here is much fuller by comparison and sexuality even starts to rear its PG-rated head – Natalie Portman is arrayed in a tongue-dropping series of costumes, while the girls get new sensation Hayden Christensen who goes through the entire film with a single brooding pout. Alas, despite being more full-blooded, the romance is still awkward and twee. This time George Lucas has on board as co-writer Jonathan Hales who had written several episodes of The Young Indiana Jones Chronicles (1992-4) and whose only other genre credit, released right before Attack of the Clones, was ahem The Scorpion King (2002). The romantic dialogue the two of them write is dreadful – it has a cringe-inducing stiltedness that almost entirely kills the film dead. And George Lucas films the romance against fields of flowers, waterfalls surrounding the frolicking lovers everywhere one looks and the two of them amid halls of Venetian architecture filled with columns of mid-afternoon light. It is a romance that exists more as a series of scenographic poses than it ever does as an emotional state ignited in the audience. Consider, if Attack of the Clones were a standard teen romance rather than a space opera then such pictorial overkill would emerge as absurdly corny. Certainly, George Lucas has created some original and exciting effects sequences – a fight through a droid foundry; a sequence with Anakin, Amidala and Obi-Wan taking on various alien beasts while chained up in an arena; and a massively scaled climax with dozens of Jedi Knights battling droid armies, clones and beasts all at once. The best sequence is one that comes early on, an exhilaratingly paced race through the air-car packed skies of Coruscant. The depth and detail in the effects is amazing – hundreds of cars buzzing about in the skies, crowds seemingly in the millions lined up around the arena, or the Jedi battle, which seems to be having at least a dozen things all happening at once during every shot. However, in all of this there is the tendency that began with Return of the Jedi of packing the screen with so much detail that it frequently reaches a point of visual information overload. Frequently, so much happens at once and so fast that you are unable to keep track of it and instead sit back and let the pretty pictures wash over you, not unlike sitting watching psychedelic patterns play on a screen. Disappointingly, there is nothing here that has the genuine wonderment that the Death Star trench sequences in Star Wars did or the Walkers sequence and the asteroid chase did in The Empire Strikes Back. Dramatically, Attack of the Clones feels inert – there is rarely ever the sense that what is happening is being carried by the story, rather that the story is merely there to connect one effects set-piece to the next. Equally, George Lucas seems to be running out of new and original effects sequences with which to wow audiences so what we get is repeats of sequences from previous films that have merely been upped in terms of action – there is a rehash of the asteroid chase sequence from The Empire Strikes Back but now it is with every rock rotating at once and explosions going off at the same time. 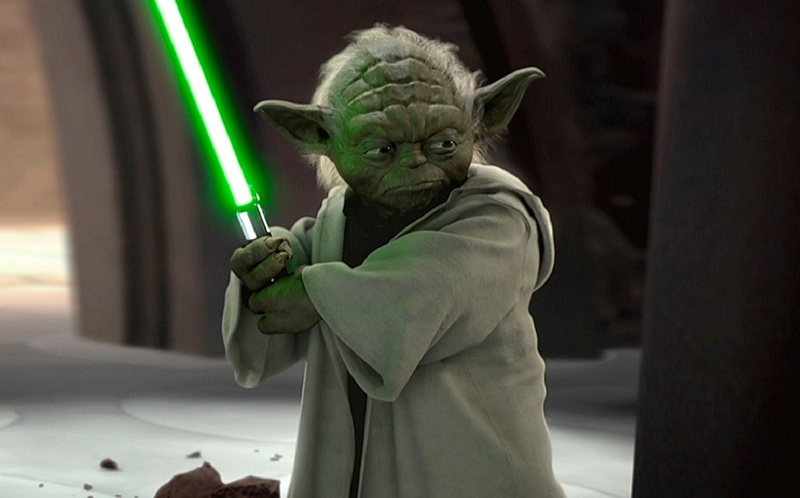 Every other film in the series has featured a lightsabre duel and by this point George Lucas is clearly experiencing some difficulty in introducing novelty into the duels – The Phantom Menace offered up two combatants vs one; Attack of the Clones offers up one opponent wielding two lightsabres, combined Jedi vs an army and, most amusingly, Yoda getting into the action like a manically leaping leprechaun. By and large, the fan reaction to Attack of the Clones was indifferent. The general response seemed to be “well at least it was better than The Phantom Menace” but there seemed a lack of wild enthusiasm about it. Most tellingly was the box-office – while each of the preceding Star Wars entries had in every case emerged as the No. 1 box-office success of their respective year, Attack of the Clones emerged as only a modest success. In its first week, it expectedly topped the box-office charts, but by the subsequent week it was toppled from the No. 1 spot by the Tom Clancy thriller The Sum of All Fears (2002). Maybe it is just that George Lucas and the Star Wars universe have passed their mutual sell-by dates. There was a time in the 1970s that Lucas tapped into the spirit of youth – both the rock’n’roll nostalgia of American Graffiti (1973) and then with the enormous ability to recreate the thrills and wonderment of his own youthful cinema-going experience in Star Wars and Raiders of the Lost Ark (1981). Star Wars made George Lucas a multi-millionaire overnight (largely due to 20th Century Fox signing away a substantial profit share, not thinking the film would be a success). That was the point that Lucas retired from active filmmaking. The Empire Strikes Back and Raiders of the Lost Ark were the last really good films he made. Everything he has made in between – the likes of Return of the Jedi and Phantom Menace, the Indiana Jones sequels, Howard the Duck (1986), Willow (1988) and Radioland Murders (1994) – have been flops, if not epic-size miscalculations. The question that now seems to be increasingly emerging is – has George Lucas lost it? Has Lucas, closeted away in reclusion in his Skywalker Ranch for nearly twenty years, lost the finger he once had on the pulse of a generation and the effortless ability to tap into their sense of wonderment? It feels like everything he has put out for the last twenty years seems only to be tepidly searching for that again or else recycling past successes. For Star Wars fandom, Attack of the Clones did not go far enough in finding its way back in the right direction. It feels like a backward-looking film, one that stands in the shadow of its original. Most of the cute bits that Attack of the Clones holds are where we see pieces of the first trilogy being stitched into place – the origins of the Stormtroopers and Boba Fett, a return visit to the farm where Luke grew up and the introduction of Owen and Beru Lars as teenagers, the introduction of the plans for the Death Star. Attack of the Clones seems less a story in its own right than it does a piece of fannish amusement designed to flesh out the backdrop to the main story. The rest never feels like it is much more than a big screen Playstation game. Maybe it simply is that fan hagiography and George Lucas’s obsessive secrecy has built the original nine-chapter saga up into something far more epic than it ever was in actuality. 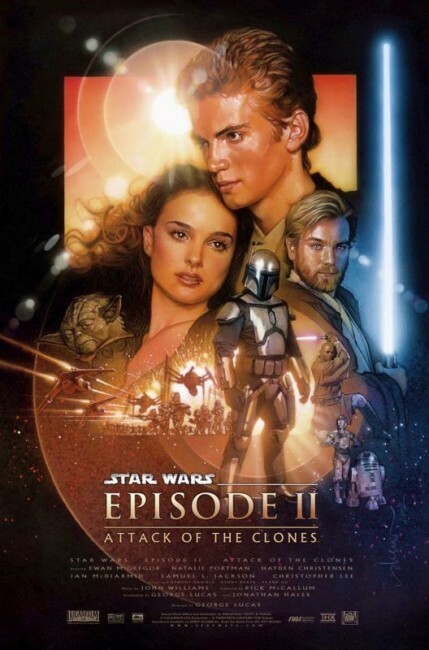 Attack of the Clones was followed by Star Wars Episode III: Revenge of the Sith (2005), where George Lucas finally managed to get it right as to what the prequels should have been. There was also Star Wars: Clone Wars (2003-5), a series of five-minute animated episodes that aired on the Cartoon Network. This was later extended as an animated film Star Wars: The Clone Wars (2008), which was the flagship for an animated tv series Star Wars: The Clone Wars (2008-14). Chronologically, the events of these would appear to happen between Attack of the Clones and Revenge of the Sith. In 2012, George Lucas sold Lucasfilm to Disney who announced the intention to produce a new trilogy of films, the first of which was J.J. Abrams’ Star Wars Episode VII: The Force Awakens (2015) and followed by Star Wars Episode VIII: The Last Jedi (2017). Disney also created a series of live-action spinoff films with Rogue One (2016) and Solo: A Star Wars Story (2018). (Winner for Biggest Disappointment, Nominee for Best Special Effects and Best Production Design at this site’s Best of 2002 Awards. No. 3 on the SF, Horror & Fantasy Box-Office Top 10 of 2002 list).